pishtech.com • View topic - bow fishing? any plans on adding bow and arrow fishing? Interest idea. I've done just a little of it in my youth myself. I think that would almost be a separate game, though. Or maybe an option in VRS isn't too out of place. It sounds like fun. I'll give it some thought. cool site a bowfin looks like a cross between a trout and a snakehead at least the one on the front page. sounds like a good fish to add and a good fighting fish for its size. I usually catch one or two bowfin a year while fishing for bass, pike, etc. I had one hooked on a spinnerbait a couple of weeks ago but it threw the hook. That happens a lot since their mouths are so bony. I've had one hooked for a couple seconds, lost it, and had it hit and hooked again on the next cast, lost it again, and hooked and landed it on the third cast. They're the only fish I know that hit a lure well enough to feel metal but still come back to hit it again right away. I suspect their mouths are so hard that the hook doesn't bother them. That or they're just so aggressive that their instinct to strike outweighs everything else. A similar rough fish to add would be gar. Around here we have shortnose and longnose. The shortnose feed mostly on small minnows. The longnose will take a bigger fish. I've caught a few longnose on crankbaits in the daytime, but more often I'll catch them at night while fishing for flathead catfish. Most longnose I've caught have been around 40 inches long, but last year I caught a 50 incher. That was a freaky fish. I was out after flatheads a few nights ago and didn't catch any cats or gar, but I boated a 25 pound snapping turtle. That's one thing I love about fishing, especially on a complicated body of water like the upper Mississippi: it's full of surprises. When I get rivers into the game I'll have to include something representative of the upper Mississippi with those species in there. 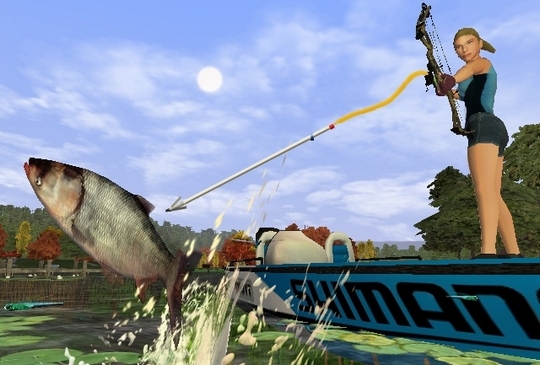 A bowfishing game would be pretty cool. The people that did the Hunter Dan stuff had a bowfishing game out at one time, but it wasn't very realistic I didn't think. so... any news on this, or are you probably not going to add it? I'm not really planning on that any time soon, but it would probably make a fun game by itself. I wouldn't mind being able to snorkel in the lakes in the game and do a little spearfishing, too. I've got a rubber powered speargun collecting dust in the basement. Long ago I used to do a little spearfishing and bowfishing.